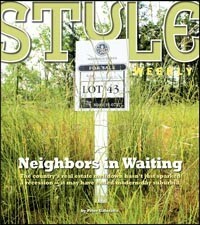 Neighbors in Waiting | Cover Story | Style Weekly - Richmond, VA local news, arts, and events. The country&apos;s real estate meltdown hasn&apos;t just sparked a recession — it may have ended modern-day suburbia. They haven&apos;t changed the telephone recording just yet. It&apos;s probably just wishful thinking because Magnolia Green faces deep trouble. In the works for nearly 20 years, Magnolia Green was to be the latest in greater Richmond&apos;s upper-middle-class residential development. Besides the fancy golf course, it featured the usual amenities such as swimming pools and walking trails. The cost of its 4,886 houses would range from $300,000 to more than $1 million. It pushed Chesterfield County&apos;s suburban sprawl to its farthest point yet along the crowded Hull Street corridor clinging to U.S. 360 southwest from Richmond. But Magnolia Green has come crashing down. Today it&apos;s marked by a vast emptiness. The bulldozers have disappeared, leaving behind unfinished roads and empty lots, with wooden sale signs emerging from the mud and silt screens. The development is a victim of the worst financial crunch since the Great Depression, falling market expectations, uncertain gasoline prices and Chesterfield&apos;s decades-long legacy of anything-goes planning that many experts say is the worst-thought-out in the Richmond area, if not in the state. An auction was held May 19 to sell off fiscally strapped Lower Magnolia Green&apos;s 3,550 not-yet-built-upon lots and the half-finished golf course. Not a single bidder was willing to put up the $5 million deposit required to participate in the auction. Ownership slipped back to iStar Financial, a New York-based bank, without a single interested buyer. Magnolia Green is just one among several large, marquee subdivisions struggling to survive. Developer HHHunt recently pulled the plug on the 4,600-unit Branner Station project in eastern Chesterfield after “the credit market just collapsed,” says Dan Schmitt, vice president and general manager of the Blacksburg-based company, which has developed such well-known residential communities as Wyndham and Wellesley in Henrico County. The future is also uncertain for the planned 5,140-house Roseland just west of U.S. Route 60 and state Route 288 in northwestern Chesterfield. The malaise has even spread to eastern Henrico County, where big projects — including Tree Hill Farm (2,700 units), Wilton on the James (3,200 units) and the Ridings (600 units) — all face financial-related delays. The turnabout has been swift. It would be easy to dismiss the delays as simply economy-related, that as soon as the dust clears the bulldozers will fire back up and families will flock to the newest golf resort communities and start living the suburban dream. Some experts, however, say there will not be the usual comeback. The economic turmoil is so profound they predict that gone forever is the big, single-lot, one-type-fits-all model that&apos;s dominated suburban development in metro Richmond since the 1970s. Financing has tightened so much that buyers find they no longer qualify for the jumbo loans that they did just a few years ago. Developers can&apos;t find underwriters for the millions of dollars they need to get the projects going. Meanwhile, shifting demographics suggest many people simply no longer want — and can&apos;t afford — to live in giant subdivisions. It could be that outlying megaprojects such as Wyndham in Henrico and Woodlake in Chesterfield will be the last of their ilk, the last of the monster subdivisions. That would change the face of greater Richmond. If the big projects wither, suburban sprawl could actually be locked permanently where it is today at such retail centers as Short Pump in Henrico and Hancock Village or Watkins Glen in Chesterfield. Future development would be closer to existing retail and commercial corridors in the suburbs — and closer to the city — leaving lots of developers with dashed hopes and tons of debt. The trend is being replicated across the United States, in areas such as Charlotte, N.C.; Atlanta; and California&apos;s central valley. There have signs of the impending shift for several years. Baby Boomers drove the megaproject trend for at least two decades, but housing analysts have noticed that they&apos;re becoming empty nesters unwilling to buy up to bigger, pricier houses. And their children increasingly seek more urban lifestyles: They don&apos;t care about golf and despise lengthy drives to work because of environmental and lifestyle reasons. Suburbs can also be costly, as $4-a-gallon gasoline illustrated last summer. Still, no one could have predicted the maelstrom that the financial crisis has brought on, which may have finally and forever doomed the giant subdivision as a viable housing model. Instead, people will move into denser housing developments, experts say, closer to the city, where commutes are shorter and schools are still desirable. Of all the areas in Richmond, the problems are most pronounced in Chesterfield. The once-rural area of loblolly-pine forests and small farms covers 425 square miles, almost twice the size of Henrico. Despite being the fastest-growing county in Central Virginia, it still keeps much of the sleepy flavor of the South Side of the state without the urban tensions of the city. Although Chesterfield&apos;s per-capita income and school-system rankings rival Henrico&apos;s, Henrico is perceived by many in the planning community as being more sophisticated. The die was cast in the 1950s when state highway planners decided to put Interstate 64 through Henrico rather than Chesterfield, giving Henrico a big edge up in transit and highway interchange nodes of commerce. Henrico responded in kind with smart, conservative planning while benefiting from the taxes rolling in from its continually expanding retail and office base. Left behind on the south of the James River, Chesterfield leaders tended to be free-market, back-slapping conservatives who preached the virtues of property rights and growth for growth&apos;s sake. From the 1980s on, they approved development after development without carefully weighing the impact on services such as schools and police. “Twenty years ago, Chesterfield was a place to raise a family,” says Kirk Turner, Chesterfield&apos;s planning director. “We saw more households with children than without.” The school system&apos;s good reputation was a big draw, along with vast tracts of land for green spaces, trails and golf courses. The Board of Supervisors tended to go for master-planning big tracts of land. State law required it to upgrade the county&apos;s comprehensive plan every five years but it did so in fits and starts and “never stepped back and took a hard look at the county as a whole,” Turner says. Magnolia Green, for example, was first rezoned in the early 1990s, as were other large projects — before the current cash-proffer system was put in place — and sat languishing for years. Because no one seemed to be looking, over the years Chesterfield has built up a whopping inventory of 50,000 lots that have been rezoned for single-family houses but haven&apos;t been built. “That number is the largest in Virginia,” says Stewart Schwartz, the director for the Coalition for Smarter Growth in Washington. It surpasses even the 38,000 empty lots in Loudoun County in the Washington suburbs, that a few years ago was the fastest-growing county in the United States. As for inventory, Chesterfield far surpasses Henrico, where Planning Director Joe Emerson puts the list at a little less than 15,000 lots, or plots of land that have been zoned for houses. In other suburban counties such as Powhatan, Goochland and Hanover, the inventory overhang is negligible. In Chesterfield, the cost of go-go development in the 1980s and &apos;90s has been high. Most planners agree that the rule of thumb is the “70-30” rule, or that 70 percent of the county&apos;s income should ideally come from residential property taxes and 30 percent should come from taxes on retail sales and commercial businesses taxes. Real-estate taxes alone cannot pay for police officers, firefighters, water and sewer improvements and enough classrooms to keep class sizes at desirable levels — especially in family-friendly counties such as Chesterfield. In the absence of smart planning and limited interstate access, Chesterfield&apos;s tax base grew out of whack. Consequently, the county&apos;s ratio is more like 75-25, or worse, Turner says, which means the county struggles perpetually to build new schools and pay for public services. Henrico&apos;s business-to-residential tax ratio, on the other hand, is more like 65-35, largely because of its much larger commercial corridors, including major office centers such as Innsbrook and the still-surging Short Pump retail corridor. It seems counterintuitive, but Turner says the county is actually breathing a sigh of relief that Magnolia Green is stalled, if not shut down. The project was rezoned without cash proffers, which means there was even less money to offset the services needed to accommodate more than 4,000 new houses. Although developers agreed to put up large sums of money to help pay for services, Turner says the sum would not have been enough. Sitting in an outdoor Hull Street cafe and talking at her usual warp speed, Marleen Durfee relishes her transformation from the Cassandra of Chesterfield to its sage. After years of serving as gadfly warning about the impacts of bad planning, Durfee pulled off a political coup in 2007 by running as an independent in a tight field against three other candidates and winning as supervisor of the county&apos;s Matoaca District, which includes Upper Swift Creek, where some of the worst sprawl is located. The Pennsylvania native moved to Chesterfield in 1986, and by 2000 she says she “noticed that something is not quite right here.” Consulting her twin brother, who is an urban planner, she started showing up at planning and supervisors&apos; meetings to ask embarrassing questions. “I went thinking they were being proactive but I realized they were using outdated plans from 1989 to 1991,” she says. The negatives of doing so were obvious, she says. “Chesterfield has some of the lowest concentrations of police coverage in the area. Twenty years ago there were about 20 school trailers and now there are 300 of them. Cosby High School opened just three years ago and it&apos;s already at capacity,” she says. She pushed so-called smart-growth policies, trying to educate supervisors about how to discourage automobile-centric sprawl and make sure that the county can sustain growth. Durfee&apos;s ascension to office marks another transition as well. For years she faced ridicule from pro-growth supervisors who disliked outside interference. Board meetings got the reputation of being sessions where speakers with complaints or serious questions were insulted. At one meeting, a man who protested too much was arrested. Durfee&apos;s arrival also made it harder for supervisors to engage in an old practice: approving controversial projects at the eleventh hour just before they were leaving office. Durfee&apos;s encouraged that good things will result from the current bad times. A place to start is the county&apos;s comprehensive plan, Turner says, which is due for major revisions by this fall and will take a county-wide view. So what&apos;s next for greater Richmond&apos;s suburbs? Not everyone agrees that megasubdivisions are dead. The end of the suburban dream has been predicted before, most notably by Jane Jacobs, a renowned writer and urban planner, who in the 1960s foresaw a wholesale abandonment of disconnected suburbs and a return to inner cities. Schmitt of HHHunt notes that his company has taken its lumps with the economic downturn. It worked hard for three years putting together the Branner Station project, for example, which he says is a “superior development.” But with the crash underwriters balked at financing and Hunt couldn&apos;t renegotiate new terms with the landowner, so the project was shut down. But he does see the size of the projects getting smaller. While development is likely to be closer to the center city, officials have another fear: aging neighborhoods. A prime example is Brandermill in Chesterfield, hailed as an award-winning development back in the 1970s. The 4,000-plus-unit planned community on a large lake has seen its assessed values plateau in recent years as houses and amenities age, Turner says. More serious problems, says Tom Jacobson, head of community revitalization in Chesterfield, involve even older neighborhoods closer to Richmond. “I&apos;m thinking of housing built back in the 1950s and 1960s, the typical rancher without sidewalks or a park. They are going to be big problem areas,” he says. Unlike Brandermill, which has parks and sidewalks among other amenities, many of the older subdivisions don&apos;t even have sidewalks. While Henrico might share some of the same inner suburb problems, megaprojects are less of an issue in the county. Emerson notes that western Henrico is pretty much built out and there&apos;s not enough land for another Wyndham. Eastern Henrico is a different story, but the projects there have been stalled by financial constraints.